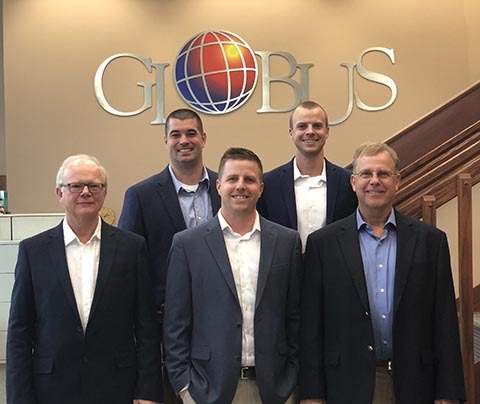 With over six decades under its belt, business continues to prosper at the 160,000 sq ft facility of Globus Printing and Packaging in Minster, OH that sits north of Dayton on the border near Indiana in a beautiful rural area. The keys to its success, explains president Dennis Schmiesing, are its incredible hard-working employees who display its great work ethic and Midwest values, its commitment to investing in new technology and finding like-minded partners, and its confidence to branch off into new areas. With its well-established catalog and bookwork humming along, Globus is steering new business toward food and product carton business within its loyal constituency of Midwest clientele. Recently Schmiesing made a strategic decision to add folding carton construction onto the production line at this 100-employee firm. But operating at maximum capacity meant that the firm needed to turn to a speedy and efficient new automated press. After diligent research into various press manufacturers, Schmiesing chose to partner with Koenig & Bauer for the first time and placed an order for a new Rapida 105 41-inch six-color UV press to be delivered in early 2019. Operating at top speeds and providing increased output, the new fully-automated Rapida 105 set for Globus will be replacing two older non-Koenig & Bauer presses—a 40-inch and 29-inch. It will be installed along with the firm’s book production capabilities: an existing web press and a new folder producing 30,000 signatures per hour. What set the Rapida apart in the eyes of Schmiesing was not only its speed and automation but the ability to incorporate UV coating inline and the notable Koenig & Bauer color control system for both its book production and carton manufacturing customers. Currently the firm is employing an offline UV coater but the Rapida will deliver much faster inline production and immediate drying especially for gloss UV on opaque white book covers. Due to the extensive substrate range capabilit of the 29-inch non-Koenig & Bauer press, Schmiesing plans to move book cover production onto the Rapida 105, giving the firm faster makeready on its four-up covers and less waste. Its new packaging customers are particularly demanding to have no color variation on its cartons that must look exactly the same on store shelves. Koenig & Bauer’s popular inline QualiTronic Color Control capability will help press operators ensure that critical color is balanced and maintained throughout the press run. The Rapida’s inline color control and register control of the sheet are all computer controlled and linked to prepress, thus quickly getting the press preset for operation. The system also provides detailed reporting and measurement documentation to pinpoint the accuracy of each sheet as it is printed. Its camera system reads every printed sheet with the same high quality camera that is found on Koenig & Bauer’s currency press models. “Since our father established the business in 1957, we’ve taken on the responsibility to build the company with ingenuity and move forward into the next generation. This new Rapida press from Koenig & Bauer well positions us for the future,” says Schmiesing. Established in 1957, Globus Printing and Packaging is a full-service printer and folding carton manufacturer located in Minster, Ohio. Globus Printing and Packaging has complete printing and binding capabilities for printed product as well as packaging products where they specialize in the production of commercial catalogs, annuals, workbooks and folding cartons. Additional services offered include kitting and assembly, mail fulfillment and warehousing. For additional information about Globus Printing and Packaging, please contact our Globus Sales Division at 1-800-968-0797. As Globus Printing and Packaging moves into folding carton production, its team eagerly awaits its first Koenig & Bauer Rapida 105 41-inch six-color UV press. They are (left to right bottom row) Dennis Schmiesing, president; Tony Schmiesing, design & inside sales - packaging division; and Tim Schmiesing, owner. (Top row, left to right) Jason Barlage, plant manager; and Alex Schmiesing, quality manager.